Genzyme and Isis announced that the FDA has approved its New Drug Application (NDA) for Kynamro (mipomersen sodium) injection. 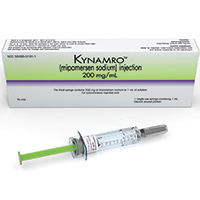 Kynamro is a weekly subcutaneous injection approved as an adjunct to lipid-lowering medications and diet to reduce low density lipoprotein-cholesterol (LDL-C), apolipoprotein B (Apo B), total cholesterol (TC), and non-high density lipoprotein-cholesterol (non HDL-C) in patients with homozygous familial hypercholesterolemia (HoFH). The approval was based on the randomized, double-blind, placebo-controlled, multi-center trial that enrolled patients age 12– 53 years (n=51), including patients age 12 to 16 years (n=7), who were maintaining a regimen of maximally-tolerated lipid lowering medications. Results showed that Kynamro further reduced LDL-C levels by an average of 113mg/dL, or 25%, from a treated baseline of 439mg/dL, and further reduced all measured endpoints for atherogenic particles. Kynamro is an oligonucleotide inhibitor of apolipoprotein B-100 synthesis that reduces LDL-C by preventing the formation of atherogenic lipids. It acts by decreasing the production of apo-B, which provides the structural core for all atherogenic lipids, including LDL-C, which carry cholesterol through the bloodstream. Kynamro is an antisense drug and is metabolized without affecting the CYP450 pathways. Due to its risk of hepatotoxicity, Kynamro is available only through a restricted program under a Risk Evaluation and Mitigation Strategy (REMS) called Kynamro REMS. Kynamro will be available in a 200mg/mL dosage strength as 1mL single-use vials and prefilled syringes.